West Windsor, N.J. -- In a perfect three-way partnership, dreams of pursuing higher education at Mercer County Community College are being fulfilled through the generosity of PNC Bank and the mentoring of the Boys and Girls Club (BGC) of Trenton. Two local high school grads, Michael Coleman of Ewing High School and Brianna Terry of Trenton Central High School, will start classes at MCCC in a few weeks. According to BGC Executive Director Dave Anderson, both students have been active members of the Boys & Girls Club, where they were selected to receive the scholarships as a result of their demonstrated work ethic and commitment to education. The scholarships cover full tuition, expenses, and even transportation costs. Anderson notes that PNC starts preparing young people in middle school by funding after school programming at the club. PNC is also a funder of "Career Launch," in which students learn about potential careers and attend career fairs. 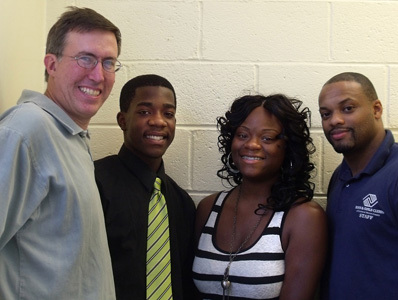 From left, Boys & Girls Club Executive Director David Anderson with MCCC-bound students Michael Coleman and Brianna Terry, the 2011 recipients of PNC Bank scholarships, and Drew Whitmore, teen services director. The journey continues in high school, when PNC helps fund work-readiness programs, providing paid internships for 200 club members, who "practice their work skills at the club," says Anderson. "By the time they are done, they can determine their path - college or technical school. They figure it out here." Anderson is proud of club members' 99 percent high school graduation rate, with 80 percent of the teens going on to college right from high school. And that's where Mercer County Community College comes in. Three years ago, PNC worked with MCCC President Patricia C. Donohue to add the Mercer scholarship component that completes the circle. "Community college is such a great bargain and such a great investment," Anderson observes. From the current graduating class, 30 students will be attending Mercer in the fall. "We get invaluable support from PNC," Andersen says. "They fund the front end with the after-school program and help us mentor the kids through high school." According to PNC's Regional President Kevin Tylus, "PNC's commitment to young people is largely centered around education." He notes that the financial institution also funds "Grow Up Great, "an early childhood education program. "Education is the cornerstone," he emphasizes. "Kids come to the Boys & Girls Club with tremendous potential and it's only through education that they can realize it. We are confident they will receive an outstanding education at Mercer." Tylus notes that on visits to the club, where he serves on the board of directors, he sees students lined up in the computer lab, waiting to access the Internet for research and school assignments. "As members of BGC, they are making that commitment," he says. "The great news is the increase in high school graduation rates among these students and the increased numbers who are moving on to college," Tylus says. Anderson adds that corporate support has been vital to the continued programming of the Boys & Girls Club. "When state funding for after-school programs was reduced, PNC, Novo Nordisk and several other companies stepped up to help with funding." "We hope our actions will encourage others," says PNC's Tylus.